Did you know more women than men need glasses? and the number of us needing them are on the rise thanks to our increasing screen time! Annoying considering more of us wear foundation...and that foundation just loves to rub off right at the bridge of the nose and make a right mess. I am not ashamed to say I have seen my glasses looking incredibly grubby due to my makeup up transferring and given the recent warm weather, they have been worse than ever. 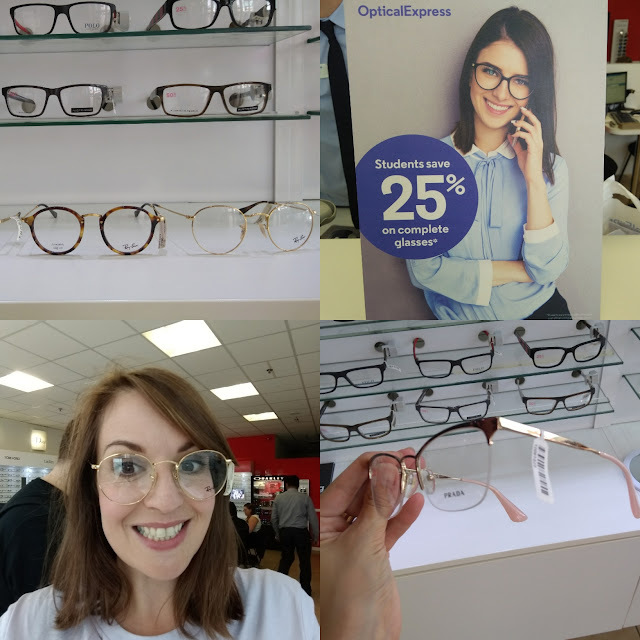 So Optical Express sent me on a little mission along with the St Enoch Centre, to take a look at their latest popular frames and to share some top make up tips for glasses wearers. 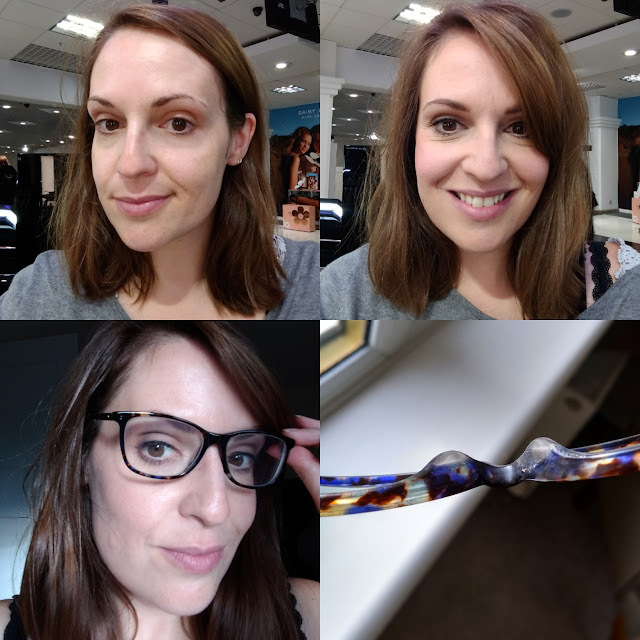 I put the question of glasses and makeup out there on instagram and had so many responses from people about the gunk they felt they were constantly clearing up, or the smudged makeup they were paranoid about, so I felt double determined to head to Debenhams to pick up a few products that might help. Getting to see what is all popular in eyewear right now, while chatting useful makeup tips, is pretty much a challenge come true for me! A decent facial primer for under foundation is a must, you want the product to have a good surface to cling to and help it from straying, if you have greasier skin go oil free and a top tip from Olivia was to pat the product on with your brush to really press it into the skin and create a solid base. To go a stage further I picked up a new tube of my favourite Urban Decay Primer Potion which I always prime my lids with and I have trialled popping a small amount on the bridge of my nose to give my foundation an extra little staying power and handily it also gives my glasses a bit of grip to stop them slipping down my face. Your frames can create additional shadow on the under eye area and enhance any dark circles which is not the fresh face we are all aiming for. Combat this with choosing a concealer a shade lighter than your foundation and use a moisturising formula, when you can, to stop any dryness which can be magnified in your glasses. At Dior I tried both the 2 in 1 Prime and Conceal and the Diorflash Radiance Booster pen dabbed lightly on top which really opened up my eye area which is no mean feat seeing as I had been up all night with baby Arthur. Also be sure to use a little loose powder on a brush to set the under eye makeup to stop any mascara streaking which is never a good look. Before, After and 10 hours after, v minimal bridge rubbing and hardly anything on my glasses! Talking of setting, a pressed or loose powder to really set in your foundation, with an extra few dabs over the bridge of the nose is essential to keeping the makeup where you want it to be. Again using a soft dabbing and pressing into the skin is much more beneficial than just brushing all over as it really secures the products where you want it to be. 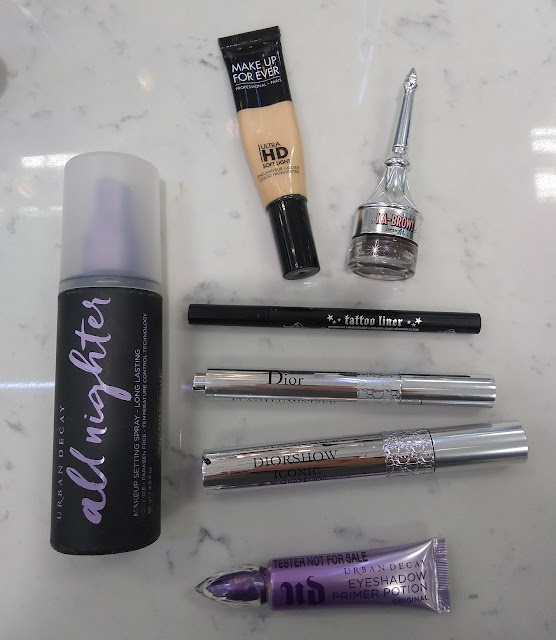 I like to take it one stage further too when I know I want my makeup to stay in place so the final product for me is always the Urban Decay All Nighter setting spray. Before popping on my glasses I make sure I have misted my face and given it a second to set and then I can pretty much guarantee smudge free makeup no matter the conditions. Wearing glasses can sometimes mean you forget to focus on other areas but having your brows on point can help frame your face. I have mine waxed at Benefit and always use their KaBrow to keep a good bit of shape as I am not blessed in the strong brow department. This stays in place which is what I need for surviving long days and big frames. Formulas for all products, not just brows, are so important . Anything smudge proof, waterproof, long lasting etc, is what you are after. 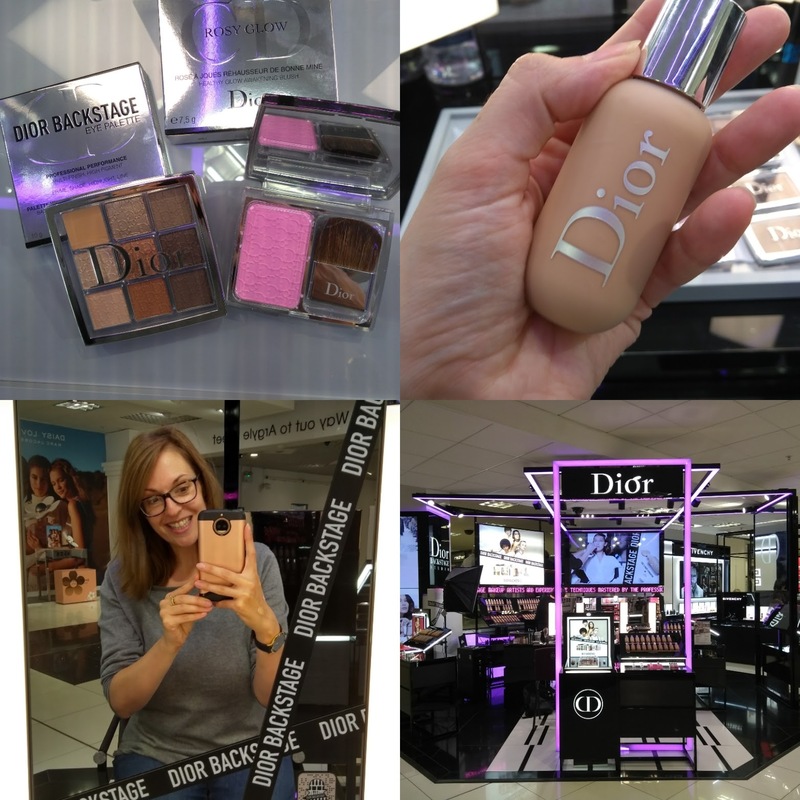 For my foundation at Dior we used the waterproof face and body foundation and it was ideal for wearing with my glasses. It means it is super buildable but looks gorgeous even in a thin layer. I usually don't wear huge amounts and that means anything that glasses could rub off is much less obvious due to the natural look. I was really impressed with this foundation and how it applied, it lasted impeccably all day and didn't separate or oxidise. I am so excited Make up Forever are stocked in Debenhams right now so I picked up the soft highlight cream as I wanted to try something with a bit of a golden sheen for popping under my eyebrows to help lift them a little which is always good for looking a little more youthful and definitely more rested!! I am a mascara fiend and love to trial new mascaras but thanks to my glasses in the past I have ended up with some total panda eye moments. The key here is to always curl them to keep them away from the lens itself and to go for a good waterproof formula to help with any sweating through the day. I went for the Diorshow Iconic Overcurl Waterproof to try at home and so far I have been really impressed, just make sure you have a good eye makeup removed in to help get it off again. It is worth taking in how your reflection looks in your chosen frames as different types can mean different make up. Even your prescription can mean you might want to tweak your routine for instance short sighted wearers can get away with a darker smokier look but long sighted might want to keep things quite light as their eyes can seem smaller from the magnification. Even your eye liner can benefit from a change depending on frame thickness, if you have thin frames go for quite a neat thin line and with thick frames go to town and create a chunky line to help with balance. Again thinking of long lasting formula I picked up the much loved Kat Von D Tattoo liner as everyone raves at how well it can survive the day. In terms of any other areas to not neglect, wearing glasses means you might subconsciously lower your blusher or contour too which does nothing but drag your appearance down and can age the face. My frames are quite large so I need to make sure I keep my blusher quite high on my cheek to draw my look up and if using contour I want to be applying the colour on my cheek bone and not in a hollow beneath which is a common mistake ( thanks Olivia!) For actual application of makeup I use a good magnification mirror ( complete with a light like the diva I am !) and I prefer a short handled makeup brush so I can get nice and up and close too. In summary I think the secret to minimising glasses disasters is in the prime and the set, take time to do that right and you have it nailed! 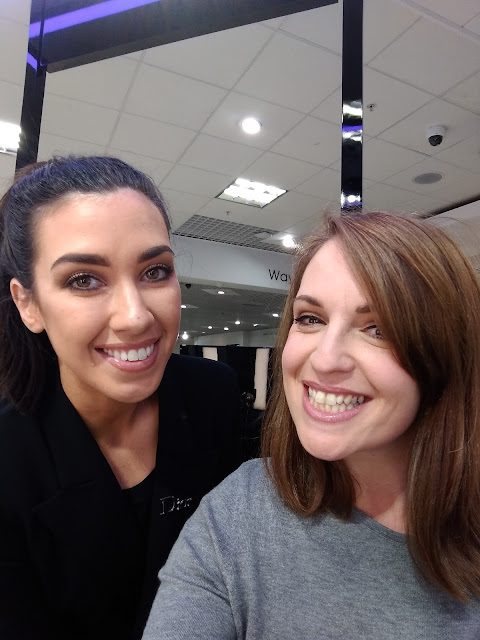 Feeling buoyed from chatting all things makeup with Olivia I headed to meet Blair from Optical Express to have a nosey around the St Enoch Store and have a play with all the frames. I hadn't been in one of their shops before but I was impressed with the quality brands they have lining the walls. There is a nice essentials collection at the lower price point too which is always needed, but of course I was attracted to the Tiffany, Rayban and Prada offering. Typical when I am on maternity pay!! But there were so many pretty designs! 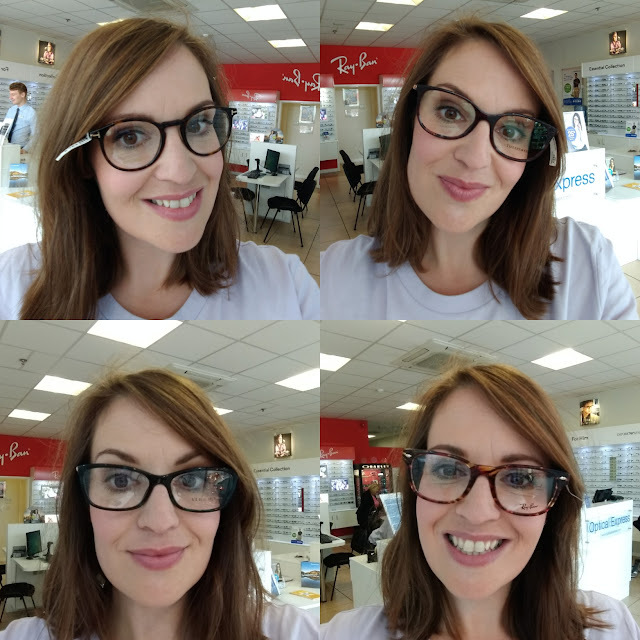 Blair filled me in on the popularity of the wayfairer style, the translucent perspex frames and the thinner metal large frames too and I have to admit they were all gorgeous. For any students I noticed they offer a good discount which is pretty handy and I had no idea they dealt with a lot of eye health conditions and laser eye surgery as well. It was good to see such a strong collection of unisex frames as well as frames for children in store so it was well worth the visit to meet the team.